Mrs. Martha E. Bastian, 93, longtime resident of the Concordia area, died Saturday at Community Hospital, Sweet Springs. Funeral services were held Tuesday at Bethel United Church of Christ, Concordia, with the Rev. Marvin Marcks officiating. Burial was in Methodist Cemetery, Concordia. Mrs. Bartian [sic] was born April 18, 1892, near Aullville. She was the daughter of Frank and Mathilde Lueck Marth. She was married to George Schollie on Februrary 26, 1914, at Concordia. He died March 15, 1928. 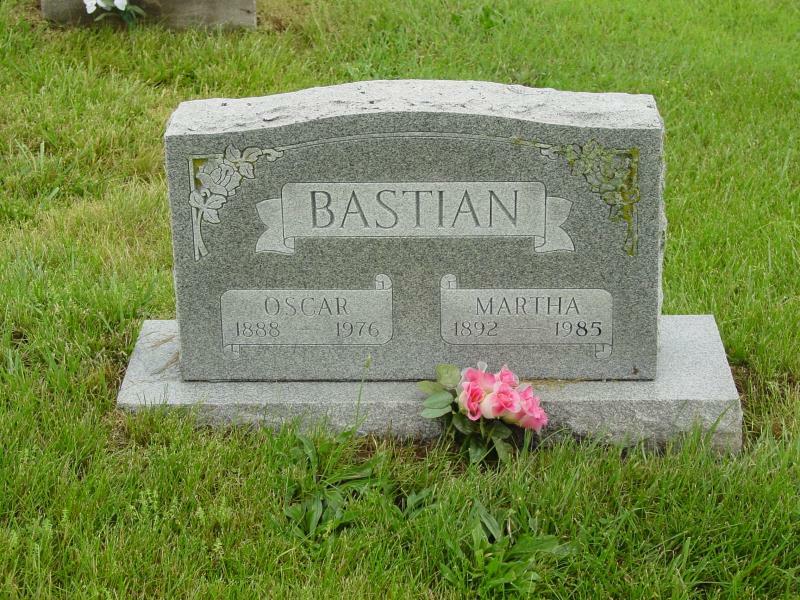 She was married to Oscar Bastian on April 10, 1937, at Lexington. He died October 13, 1976. She was a member of Bethel Church. She was a lifelong Concordia area resident with the exception of from 1945 to 1959 when she lived in Kansas City. Survivors include four daughters, Edna Von Holten, Sedalia, Nora Crider, Lansing, Kansas, Fanita Pickett, El Cajon, California, and Dorothy (Mrs. Raymond) Vinson, Old Hickory, Tennessee; one stepson, Norbert Bastian, Sedalia; one brother, Otto Marth, Concordia; nine grandchildren. Pallbearers were William Leonard Purcell, Walter Von Holten, William Kostis, Frank Leas, Johnny Marth, and Ervin Henning. Arrangements were by the James-Berg Funeral Home. The family’s memorial preferences are Bethel Church, Lutheran Good Shepherd Home, or Community Hospital. Martha Bastian was my g-grandmother.